language « kNOw Future Inc.
Is Paper Sharing Killing the Newspaper Industry? 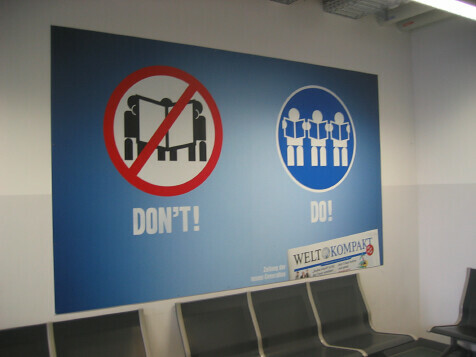 I found this advertisement in Schonefeld airport in Berlin recently and was struck by the image which suggests the proliferation of a whole lexicon of anti-sharing imagery. So does this ad tell you (a) not to share the news with your friends and neighbours (b) that reducing the distribution figures for the paper is hurting advertising income or (c) that “Welt Kompakt” is great because it’s a more convenient size than a broadsheet?